For those of you without alternative energy means, when at anchor and away from shore power for extended periods, do you charge your batteries based on amps consumed and then returned or based upon a target voltage? On my link 10, it displays the voltage or the amp hours consumed / returned when charging. The amp meter counts down from zero or a positive number as the batteries are discharged then counts up as the batteries are charged. 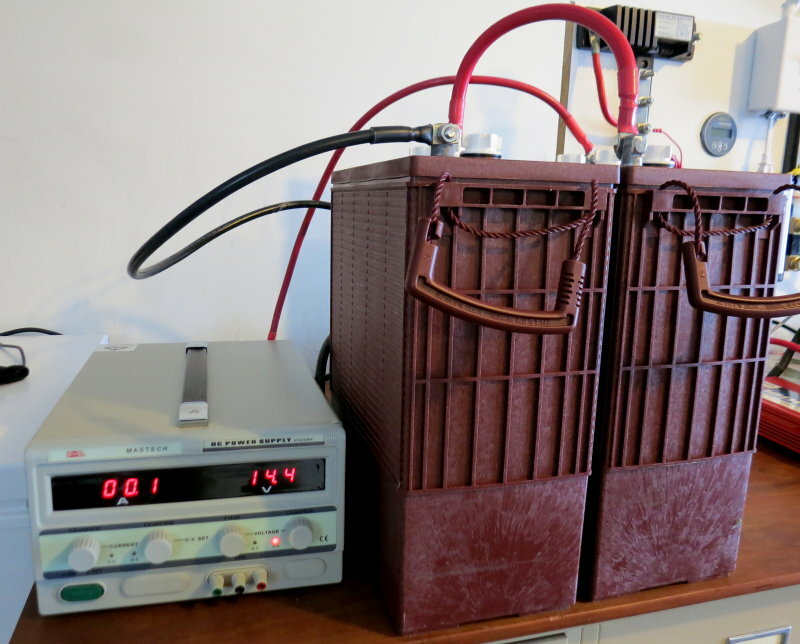 For other battery chemistries, often voltage is better. To use a hydraulic analogy, voltage is a measure of the "pressure" of the battery bank while amperage is a measure of the "volume" of power (per unit of time). Accordingly, Amp-hours are a measure of the power consumed or restored and the consequential power potential of your battery bank. Given that, in recharging, one's primary concerned with amp hours. Note, however, as a practical matter it is very difficult to get more than about 80% of total capacity within a reasonable time period if recharging with ones engine. Since you have a battery bank where your voltage is going to be analogous to the average volts of all the batteries, the Link10 current charge value is going to be much better. It uses a simple (but big) shunt that is quite accurate and you tell the Link10 the "Peukert" value for your battery chemistry to make it ever more accurate. I use the Xantrex link pro and once ever 2 weeks or so I'll charge up my house bank to 100% so that the actual charge and Xantrex's state-of-charge get synchronized. The only possible problem you might encounter is that there are loads on the battery bank which don't go through the shunt. For cruising I generally consider LA batteries "full" when the accepted net current flowing into the battery bank, at absorption voltage (14.4V), is 2% or less of the bank Ah capacity at the 20 hour rate. At a 14.6V absorption voltage I consider full at about 2.5% of capacity..
For a 100Ah bank cruiser full would be 2A flowing into the battery at 14.4V. For a 400Ah bank cruiser full would be 8A flowing into the battery at 14.4V.. If the charger, alternator or solar has dropped to float voltage you may need to do a re-set and get it to absorption voltage before determining full. A lower/float terminal voltage will mean less accepted current flowing into the battery. Many charge sources prematurely drop to float level before the bank is actually full and this only serves to extend the time it actually takes to get to full. Chargers, regulators and some solar controllers can be tricked into going back into absorption by turning them on & off. Keep in mind this is not necessarily truly full just full enough for cruising. That last few % can take many, many, many hours due to declining acceptance. Stopping the charging when the battery monitors amp hour counter reaches zero is not a very satisfactory way of charging the batteries. 1.The best way is terminate the absorption phase is using battery return amps. This method actual looks at both voltage and amps (not amp hours), but very few boat systems do this. 2.The second way is to use voltage and time. Terminating the absorption phase when a certain voltage has been reached for a certain time. 1. Above 14.3v with a charge current of less than 1.5% (6A for a 400AHr battery bank) entering the batteries. 2. At, or above 14.5v for 1.5 hours. Noelex77 - If you were replying to my post, I should add that I don't stop when the Xantrex tells me 100% but when my Victron battery charger tells me that the acceptance rate has gone low enough. Since charging above 90% is slow and takes forever, I only do this when I have other tasks for my genset such as making water or doing the laundry because genset don't like to run under no load at all. Noelex77 - If you were replying to my post, I should add that I don't stop when the Xantrex tells me 100% but when my Victron battery charger tells me that the acceptance rate has gone low enough. No I was responding to the OP. Be careful if the Victron battery charger is using it amp output to terminate the absorption voltage. This will only work if there is no load on the system, the battery charger is communicating with the battery monitor, or the battery charger has a shunt to measure the actual current the battery is accepting. I agree 150% that battery net acceptance is the best way. Many boats have the capability, all you need is a properly wired ammeter & volt meter or a simple battery monitor which measures current and voltage. It is very simple to determine cruising full.. Check Voltage - is it 14.4V +/- (absorption) at the battery terminals? Check Net Current Into Battery - is it less than 2%, 1.5% of "C" etc.? If yes to both then the bank is pretty much full. Whether you use 1% 1.5% or 2% is a personal preference..
All you need to know is the battery terminal voltage and net current being accepted by the bank. Best practice would be to turn off DC loads when doing this, especially if you have a marginal charge source such as a small charger or small alternator. All you need is a properly wired ammeter & volt meter, which most battery monitors have. Check Net Current In - is it less than 2%, 1.5% of "C" etc.? Yes agreed. If you terminate the absorption phase manually all boats can use system 1 and this is the most accurate way. This may help if your just looking at voltage. I have done it both ways. Going by voltage, I pretty much used voltage as an indicator of when to recharge (not when to stop recharging) You will have to become familar with how long it takes. I used a table similar to above. Using amps you will need to know the accuracy of that rather complex system. However, seeing how long you are pounding in the "big amps" is good and you can see when you've gone to float mode. Interestingly, I have a new battery in my car and two new ones in my boat. All of them read 12.45 volts (resting) when apparantly full/no load. Have batteries changed? To clarify, my question should have indicated that the only charging source was the engine alternator and I was trying to know how to recharge the batteries when this is your only source of power in a remote anchorage. I am currently working on the hard and my Link 10 seems to always be off .1 or .05 and the battery charger is shot and is overcharging the batteries. Until I get the charger replaced I need to manage my charge manually via the charger so I can have fans and whatnot running while toiling away. It is this that caused me to realize that if I were faced with this situation while anchored, I wouldn't know how to determine how long to run the engine to charge the batts until the next charge cycle (the charger seems to be stuck in bulk charging mode). So far the amps below X at voltage Y makes a lot of sense to me. Do any of the battery monitors have an alarm feature that would sound when those states are triggered? The analog gauges on the breaker panel are useless... the DC voltage goes from zero all the way up to about 80 so its not easy to determine the actual voltage. Same answer.... Voltage and net accepted amperage. You have a Link 10 it will give you both the battery terminal voltage and the amps being accepted. you can't use voltage to stop charging. because as soon as the engine starts you're going to be at 14v. and it will stay at 14v. before it's charged, and after it's charged. the only way to use voltage would be to turn off the engine and wait a few hours for the battery voltage to settle. are you going to run the engine for a hour, stop for an hour to check, run for another hour, etc. would be a huge waste of time.